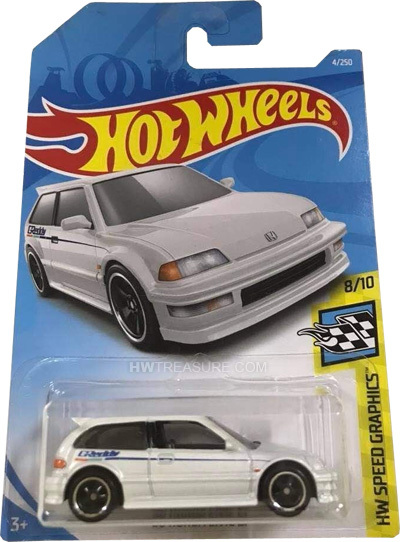 FYG11 is part of the 2019 Super Treasure Hunt set and 8/10 in the HW Speed Graphics series. The compact car is Spectraflame white with blue pin stripes accented by turquoise and red. “GReddy” details the sides and the back has “Civic” inside a red stripe. “TH” can be found on the rear licence plate. The car has tinted windows, a gray interior, 5-spoke Real Rider wheels, and a black plastic Malaysia base. 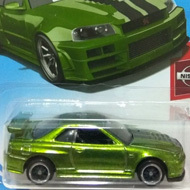 This vehicle can be found in mix “A” of 2019 Hot Wheels mainline cases. The 1990 Honda Civic EF made its debut in the 2013 HW City – Night Burnerz series. It is a 3-door hatchback and a fourth generation Civic.